The recent news that the Royal Horticultural Society are going to trial the most popular home made remedies for the control of slugs is great news for gardeners everywhere. They will be testing sharp horticultural grit, jars partially filled with beer, wool pellets, egg shells, copper tape (with serrated edges), gel repellents and pine bark mulch. Researchers at the Royal Horticultural Society will sow lettuce – a slug favourite – in pots and raised beds which will be treated with different ‘control methods’. The leaves of each lettuce will be examined weekly for damage and at the end of the experiment they will be harvested and weighed. Those with the least damage and greatest crop yield will point to the best slug deterrent. The traditional treatments will also be compared for effectiveness with doing nothing at all. It will be interesting to see what these trials find, however chatting to our customers these past few weeks it appears we have been invaded by all sorts of problems ranging from caterpillar, mildew, whitefly, aphids and even early potato blight. Keeping our crops and borders growing well requires good housekeeping, including making sure all our plants have good air circulation, are kept well watered (especially newly planted material) and of course well fed. As we finally get to enjoy and relax in the garden, Nature keeps us on our toes and just like the best plate spinner its a matter of keeping things moving, scrutinising and learning from our green fingered antics. Enjoy your summer garden - whatever the weather! Summer has finally arrived so we can enjoy it to the maximum with our range of garden furniture from traditional wood of Alexander Rose to contemporary metal of Kettler, both ranges are available on display in the Shop. New this season is the Kettler Panalsol® which is a new idea in garden accessories giving a 3m x 3m area of protection from the harmful UV rays of the sun. The weatherproof steel frame allows the canopy to be slid down to give shade as the sun moves. The frame can be anchored to the ground on fixing plates to give added security. 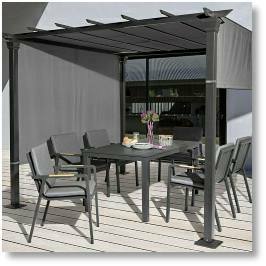 The Panalsol® provides cool shade in which to enjoy a meal in your garden. The frame costs £399 and the canopy is £100. Do come and have a look at the one set up in the Shop set above and around an 8-seater Kettler Cortona Wisteria set. It looks incredibly stylish yet is highly practical. Our children’s area has been totally revamped and given a whole section within the Shop. We have a full range of gardening tools specifically aimed at children, including Gruffalo themed products such as kneelers, gardening gloves and brightly coloured Wellington boots. There is also an extensive range of Orchard Toys, games and puzzles - perfect for providing hours of entertainment and amusement in the upcoming summer holidays. We have also tweaked our range of children's books, to include activity and play titles. These are available in our children's area. A Shires’ ‘Bunny’ Playhouse is on display and these can be ordered in Shiplap Pine (the model on display) or Pinelog. Please contact our Customer Service Desk for full details of the Shire range of Sheds, Summerhouses and Log Cabins. eflective wind spinners around. The eye-catching designs create a mesmerising holographic-like effect when spinning. The various different angles provide multiple surfaces for light to reflect, from causing shimmering and sparkling as the spinner rotates in the slightest of breeze. Each spinner (pictured is the Peacock design) is aerodynamically shaped to catch the wind and includes a smooth spinning swivel clip so it's ready to hang and spin in the breeze, providing years of enjoyment in your home or garden. 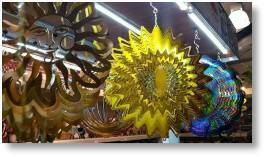 Do have a look at the spectacular display - you will be mesmerised by them! They start from £14.99 for the 15cm size up to £24.99 for the larger Orb Spinners. Our new wildlife display, set close to our bird feeds and accessories, is brimming with nest boxes, butterfly, bee and bug biomes, insect and ladybird hotels, a solitary bee hive and hedgehog shelters. A range of educational activity products from Insect Lore have also been included to give children plenty of interactive ideas, especially with the long summer holidays fast approaching. The range includes a Nature Sound Lantern which features the sounds you would expect from the jungle or wood, a Magnifier Bug Jar perfect for catching your garden creatures and then using the acrylic lens to view close up with them and a neat Nature Scope perfect for bug collection with a built-in microscope for closer examination. If you are planning activities for your children over this summer do please come and have a look at the variety of activity projects we have available; they may provide the perfect nature adventure. We have a new range of Neudorff Nematodes available in the Shop. Traditionally if you required nematodes for Vine Weevil, Chafer Grub and Leather Jackets for your garden you would need to order them and they would arrive by a special mail-order supplier. Our new range have a good shelf life so you can buy them and take them away to apply straight away. So, how do nematodes work? If you apply nematodes to the pest - either in the soil or on the plant - the nematode ejects bacteria inside the pest's body. These bacteria multiply and cause blood poisoning, leading to the death of the pest. The host tissue is then fed on by the nematodes, and as they feed they multiply, and immediately start searching for new hosts so more pests are destroyed! For the organic grower, this is a biological - not chemical - pest control. It also has the advantage of being reasonably specific to the target pest, so that other wildlife is not affected. Finally we have a new range of robust and practical storage units for outdoor storage from Keter. The range includes the robust Oaklands Shed featuring steel construction with durable plastic and wood effect panelling. The strong floor makes it ideal for storing heavier items. 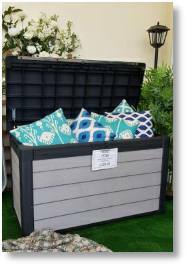 The popular garden range of storage boxes come in many sizes, again robust construction with a piston opening system. These are ideal for storing garden equipment, pads and cushions and even your wellies! One of the popular models, the Denali 100 Garden Store is pictured left and costs £129.99. Please ask for more details or see the range in-store. When I was a young girl, many, many moons ago, one of the joys of Saturday mornings was going to the bakers to collect the bread warm and smelling wonderful straight from the baker’s oven, writes Pauline Brown. I used to surreptitiously pull off flakes from the top of the cottage loaf as the walk home always gave me a good appetite! When we were first married (again many moons ago) there was such a baker in Buckingham and over the years good bakers have come and gone and as we dislike mass produced bread investment in a bread machine gave us the chance of continuing to have good bread without me having to give too much time to the task of baking bread. Recently we were approached by Reece Hetherington (pictured right), an artisan baker based in Brackley, who has in the past come to the Garden Centre to sell his bread, cakes and other products at such events as our Apple Days, asking if we would consider stocking his bread. We were definitely interested as our range of cakes, cheeses, biscuits, chutneys, jams and curds have proved very popular and bread is a natural addition to this range. I ‘phoned back only to be told he was not able to get to the ‘phone as he was up to his elbows in dough! An exaggeration perhaps but proof that his loaves would be something different to the average ‘supermarket’ loaf. Reece has been into cooking for over 25 years and back in the early days he was based in Bedfordshire. He was born in Hatfield, Hertfordshire and firstly qualified as a chef and when working at St. Albans Abbey his skills with confectionery were spotted and he went on to do a bakery course and that is when his future was sealed. In his early career he cooked at Hatfield House where he baked for the Queen, and goods he cooked were served in the Hilton and Savoy Hotels as well as more lowly places such as roadside food outlets and supermarkets! He became independent back in 2006, actually baking from his home, at one time specialising in wedding cakes. In 2014 he moved to Brackley and opened a shop at 38 Market Place. This shop in the old part of Brackley was renovated for him and when this was done revealed physical evidence of clay tobacco-pipe manufacturing in the town during the 17th and 18th centuries. This is a piece of ‘useless’ information in connection with the present business, but it does show how towns and businesses develop over the ages! 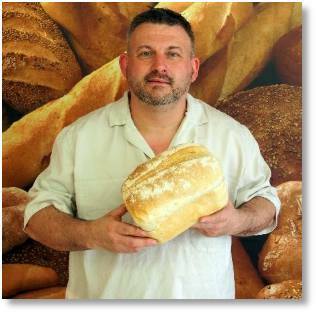 Reece and his partner are up to start the day’s baking at 1am in order to get the bread and rolls baked by 7am to make sure everything cools down and is ready for the shop or delivery by 7.30am. The bread is proved slowly, thus making it very different to ‘supermarket’ bread, so the time it takes to make and bake a loaf is approximately 3 to 3½ hours, but despite this they produce about 500 loaves a day, French sticks plus thousands of rolls and baps. These all are baked in a five deck bread baking oven on site in Brackley. When ready this bread, which smells absolutely delicious, goes into the shop in Brackley, which is run for Reece by two ladies. The shop not only stocks the freshly baked bread, but cakes, sausage rolls and really fresh sandwiches, rolls and baps. I say really fresh because the customers choose their bread and filling and the sandwich is then made whilst they wait! Dave, Reece’s van driver, is on hand ready to take out about 12 deliveries a day to local restaurants, pubs or outlets like ourselves. The bread is made from flour supplied by G. R. Wrights or Heygates. 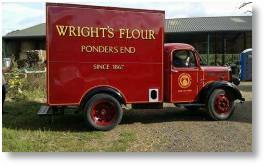 Wrights are based in Enfield and is London’s last flour miller and Enfield’s oldest business – 150 years. It is still a family business and their mill is now called Ponders End Mill. Heygates, also a family business, has a longer history as their mill at Bugbrook in Northamptonshire is on a site where there has been a mill since 1086 or before, as it is mentioned in the Domesday Book. The Heygate family were originally farmers in Northamptonshire and moved into milling in the 19th century and now produce flour, animal feeds and also have an outlet for baked bread. oomer, Sesame Seed Bloomer, White Cottage Loaf, Tiger Bloomer Loaf, Tiger Rolls, White Finger Rolls, and White and Wholemeal Baps. We are considering taking customer orders for bread to be picked up on our delivery days so our customers are not disappointed that their favourite bread is sold out when they come. If you would be interested in this service please let us know. SUMMER PRUNING on Friday 20th July, 10am-1pm. Timely pruning advice covering a host of plants including fruit trees, shrubs, topiary and roses. 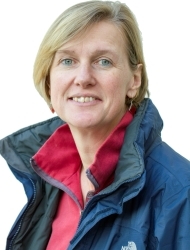 Clare will give you an opportunity to be ‘hands-on’ with some practical pruning sessions too. AUTUMN/WINTER ESSENTIALS on Saturday 20th October, 10am-1pm. 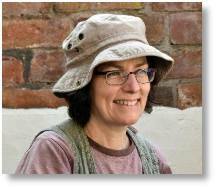 Clare will provide a detailed look at the tasks - pruning, planting potted and bare-root plants and propagation - which commands our attention at this time of the year. We have limited spaces on each workshop of no more than 15 people. Booking is strictly on a first come first served basis. Please note tea or filter coffee will be available at the start and during each workshop. 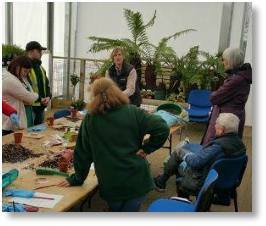 The cost for each Workshop will be £19.99 for Garden Club Members and £24.99 to BGC non-Members. PUZZLE CORNER - OUR LATE JUNE/JULY CROSSWORD! Would you like to win a £25 Buckingham Garden Centre Gift Voucher? Enter our crossword competition below. Use the clues to fill in the answers. Take the letters from the shaded boxes which form an anagram of a sweetly smelling tree. 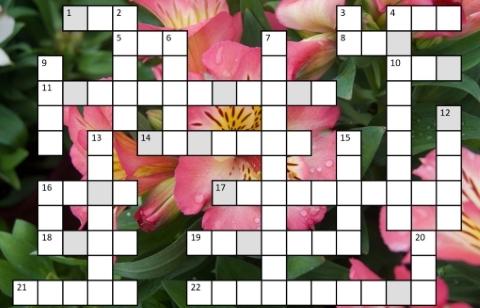 Once you have solved the anagram, send the plant name you have discovered by e-mail to competitions@buckingham-nurseries.co.uk with subject line “July Crossword” or post your entry to July Crossword Competition, Buckingham Garden Centre, Tingewick Road, Buckingham, MK18 4AE. Closing date 31st July 2018. The answers to last months crossword can be found HERE. 13. Stachys has HAIRY leaves? 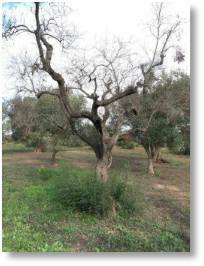 In our January/February Newsletter this year we wrote about the threat of Xylella and as we consider this is such an important issue we are reiterating that this really is a Big Issue which everyone should be fully aware of. Xylella was first identified in California on grapevines in the 1890s then one hundred years on the bacteria was being rapidly spread by an aptly named Glassy-Winged Sharpshooter and by then was detected in Brazil on citrus trees. Up to 2013 it was really only known to be present in the Americas and Taiwan, however, when it appeared that year in Southern Italy devastation hit about one million Olive trees, killing them and of course destroying the crop, a valuable source of income of that area. This forced the price of olives and olive oil to rise by about 20% across the EU. Almond trees and Oleander in the area also tested positive. By July 2015 it appeared in Corsica, then three months later Polygala myrtifolia was hit in France in the Nice region. Then by August 2016 it was detected in Germany between Saxony and Thuringia, January 2017 in Menorca, Ibiza and Mallorca and June 2017 in Valencia in Spain. one of the most serious, dangerous plant bacteria worldwide causing a variety of diseases with large economic impact on agriculture, public gardens and the environment. With that in mind we do not want it here! In Europe alone 359 plants species, including such favourites as Rosemary, Lavender and Hebe, have been identified as susceptible. Many species show no symptoms so making it difficult to detect but they provide a reservoir so the bacteria from these could be transmitted by a sap sucking insects, such as Froghoppers or Cuckoo-spit, or even by root contact, to other plants which when infected die. It is therefore very difficult to control and there is no known treatment. There is, at last, quite a lot of information available on line but it is imperative that everyone is aware of this threat so no material from known sources comes into this country. There is strict control within the plant industry, but despite this it appears that some are not taking as much care as they should. 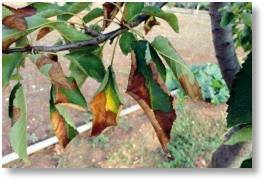 At the recent Chelsea Flower Show, RHS director-general Sue Biggs warned: "Xylella is lurking on the continent and it could come to get us at any time. This is one of the worst threats to horticulture in a long time and we must do whatever we can to stop it from happening". The Royal Horticultural Society is calling on all householders and garden centres to buy UK-grown plants rather than foreign imports. In compliance with EU emergency legislation, an outbreak in the UK would trigger the destruction of all host plants within 100m and the area would then be treated to control vectors. Restrictions on movement of plants within a three-mile radius would be put in force for five years. This would obviously lead to considerable environmental and social impacts. All we can do here is to make sure of the provenance of all plants bought in to the Garden Centre and try to make all our customers aware of the potential danger, especially if they are travelling in any of the regions mentioned above. It has been a busy few months at Evenley Wood Garden with the Spring eventually arriving allowing the wood to finally dry out a little and the gardening commence, writes Alison O’Hare. We said good bye to Justin Litten, who has moved on to a private woodland in Norfolk and welcomed Tom Clarke, our new Head Gardener, who has made an impressive start getting to know the wood garden. We started the month admiring the cherry blossom on our avenue of wild cherry, Prunus avium ‘Plena’, trees which leads us into the woods and down to the pavilion where our two large flowering Handkerchief trees (Davidia involucrata) stand. These magnificent trees have branches which tend to grow horizontally, and tiers of white handkerchiefs cover the tree. When viewed close up, the flower heads are most unusual. At the centre, there is a ring of purple anthers, which are surrounded by an inch-wide corona of light green petals. When the flowers are disturbed by a light breeze they flutter in the wind like a flock of white birds. 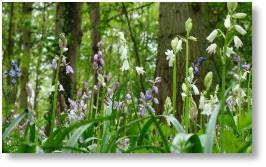 And of course, the addition of the pink and white bluebells in the beeches are always a magnificent sight to behold. As the month has progressed our acid patch of soil has come into its own with a spectacular display of Magnolias, Azaleas and Rhododendrons all flowering and sending a floral scent throughout the woods. 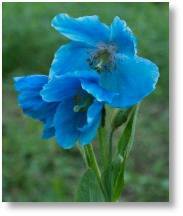 Another new addition making its mark in the garden is the Meconopsis or Himalayan blue poppy we planted last autumn. Meconopsis have the reputation for being not the easiest of plants to grow, being a lover of cold, damp conditions so in some way our miserable March and April could be responsible for the fabulous display we have seen over the last week or so. At this time of year, it is always busy in the woods with maintenance jobs such as mowing, strimming, weeding and this year in particular clearing any damage from the harsh winter. Another never-ending job for Sue, a volunteer at our woods, has been protecting the lilies from the lily beetles, which is being helped by the addition of the coffee grounds from our café. With signs of a couple of rhododendrons about to go over it means the lilies are getting ready to flower and take centre stage ensuring the hard work protecting them is worthwhile. Things to look out for over the coming month, Cardiocrinum giganteum, commonly called Giant Himalayan Lily, where we are expecting quite a show with these lilies standing over 2.4m (8ft) and flowering only once every 7 years. Another sight to behold is the Lijiang Rose. Evenley Wood Garden is one of only two places to see this particular rose in the UK and it currently stands at over 9m (30ft) tall. For years gardeners have been struggling to eradicate invasive perennial weeds such as ground elder, bindweed and couch grass often resulting in them using Roundup or other weedkillers containing glyphosate to kill the weeds, writes Pauline Brown. There is, of course, a lot of discussion as to the safety of glyphosate consequently many are very reluctant to use it, so maybe the ancient Inca race of South America unconsciously held the solution. rganic, took up research on this which led them to South America where the Incas had been growing potatoes free from eelworm damage in the same ground for years. 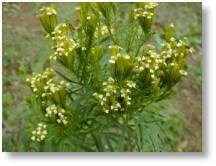 They had interplanted the crop with Tagetes minuta and it was found that chemicals given off from the roots were repelling the pests. The common name for this Tagetes minuta is Southern or Mexican Marigold or for some reason I have yet to find out Stinking Roger. In Peru, Ecuador and parts of Chile and Bolivia it is used to make Wakatay paste, the dried leaves are used as an edible herb with an apple flavour and it is used to make a refreshing herbal tea. In this country this plant will definitely clear many perennial weeds such as ground elder, couch grass and bind weed (all pictured right) as the chemical given off by the roots will clear not only grubs in the soil but also these weeds. However, it is not the most ornamental of plants, growing from seed up to 1.8m (6ft) or more in one season and only producing small pale yellow flowers which look rather like a pale, impoverished groundsel flowers. 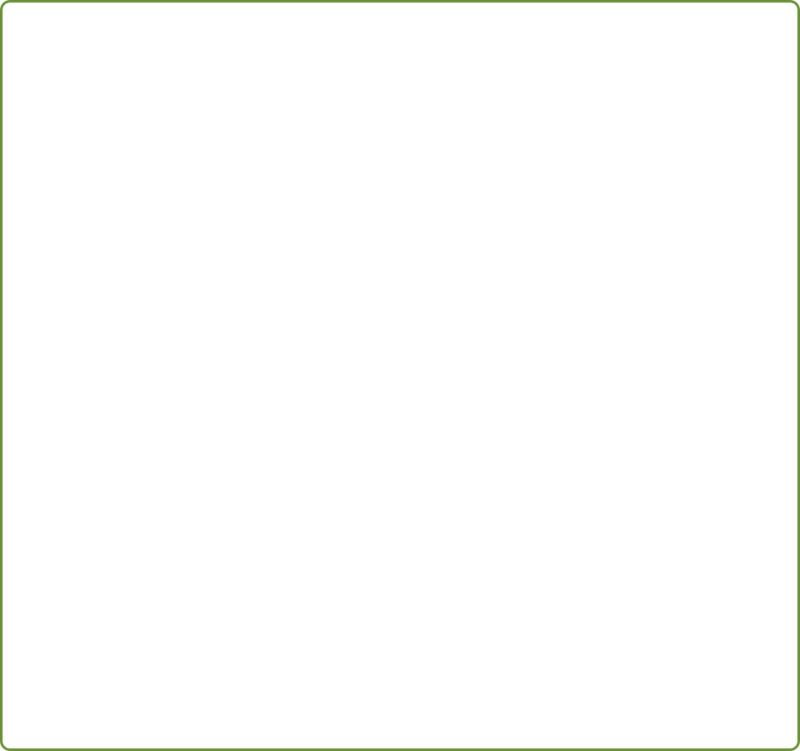 The leaves are however quite distinctive and attractive being dark green and finely cut. If practical in the area the weeds need clearing the Tagetes should be planted 45cm (18in) apart, and for long term deterrent they do make a very unusual backdrop to a border. If it is not practical to grow these plants to smother the weeds in one go, it is suggested that a round or a square area about 45cm (18in) across is planted up thus clearing this area. In the following year the adjacent areas should then be tackled. In order to do this you will need to obtain the seed of this half hardy annual and these are listed on Sarah Raven’s or Chiltern Seeds’ web sites. One warning is that some people can get skin irritation from the plant so if you do have a sensitive skin it would be advisable to wear gloves when handling the plants. This year has been declared ‘Year of the Marigold’ with events going on around t he world to showcase the variety and beauty of the marigold family. 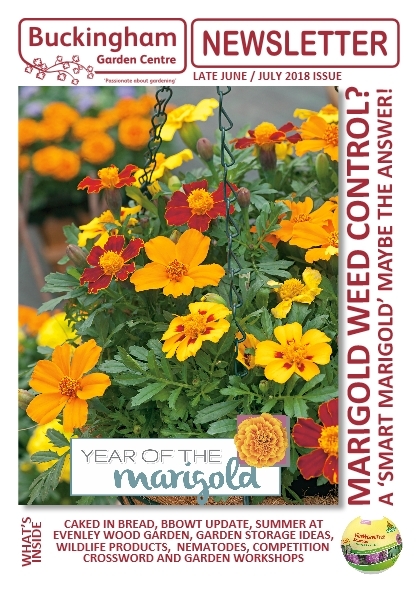 RHS Garden Wisley is holding a new trial this year with over 150 new varieties of marigold under scrutiny. The trial will be mirrored by similar displays in the Jardin des Plantes in Paris and Ega Park in Erfurt, Germany. 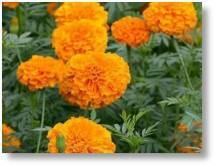 Look out for both French and African marigolds at the Garden Centre. Which varieties are YOUR favourites - do let us know! 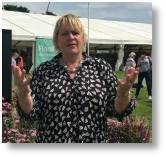 A wild garden is a healthy garden, says Wendy Tobitt from the Berks, Bucks & Oxon Wildlife Trust. There are around 15 million gardens across the UK, and if they could be linked together they would create an area larger than all the National Nature Reserves. Gardens create a network of wildlife habitats through hedges, flower borders, trees and ponds, which shows just how important gardens are as mini nature reserves attracting bees, butterflies, hedgehogs, frogs and birds. 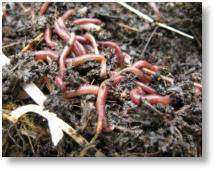 Fundamental to all gardens, and of course nature reserves and the wider countryside, are earthworms. These wonderful ‘engineers’ keep our garden soils healthy so that we can grow tasty vegetables, beautiful flowers and trees and they even help to store carbon and reduce climate change. This year The Wildlife Trusts and Royal Horticultural Society are celebrating earthworms in their Wild About Gardens campaign to encourage more people to make their gardens healthy mini nature reserves! Whether you favour the ‘bowling green’ lawn or tufty, daisy-filled grass, earthworms are the essential creatures that you rarely see, while they constantly burrow, munch and poo underground. Often known as ‘nature’s ploughs’ earthworms make vertical and horizontal burrows allowing oxygen and water to keep soil healthy. They consume leaves and other vegetable detritus to create casts, or worm poo, which release nutrients to improve soil fertility as well as storing carbon. Earthworms are essential for a healthy garden, so let’s keep them happy by making compost heaps and then digging in the lovely compost to feed our plants for pollinators, especially butterflies. 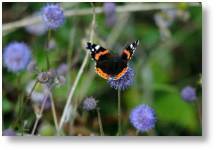 This summer you can also help to look after butterflies by planting nectar-rich shrubs, and creating habitats such as a nettle patch for the butterflies that spend winter in our gardens and sheds. Red admiral, small tortoiseshell, peacock, comma and brimstone butterflies spend winter in a state of torpor underneath shelves in sheds and deep in ivy. They respond quickly to the warm spring sunshine and are the first to fly, mate and lay their eggs, often among nettles. A patch of nettles helps to create a healthy wild garden so when caterpillars emerge from butterfly eggs they will feed on nettle leaves before transforming into butterflies later this summer. Photo credits Growveg.co.uk (top left), Amy Lewis (bottom left) and Adam Cormack (right). EVERY SUNDAY Between 10am-3.30pm you can stock up on your fresh vegetables and fruit from Peter Miller and also purchase a superb range of competitively priced fresh meat and poultry from Lee of Crawley’s Family Butchers from Brickhill. Please note Peter will be missing on Sunday 8th July and Sunday 26th August. 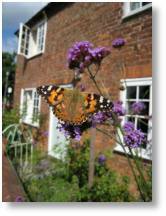 TUESDAY 26th JUNE Winslow Community Bus organised visit to Hidcote Manor & Kiftsgate Gardens. Full details available in store. Price £10 for travel, plus normal entry fee to gardens. To book please contact Sue Marchant on 01296 715786. FRIDAY 10th to SUNDAY 12th AUGUST The Berkshire, Buckinghamshire & Oxfordshire Wildlife Trust will be joining us in the main foyer between 10am - 4pm. SUNDAY 19th AUGUST Garden Centre visit to Highgrove Garden, Tetbury in Gloucestershire. The visit includes a fully guided tour around the gardens. £65.00 for BGC Garden Card Members, £70.00 for non BGC Members. See instore for details and to book please contact the Customer Service Desk. We only have 25 places to fill so book soon! WEDNESDAY 12th SEPTEMBER at 4pm Roses with Andrew Mikolajski. Roses are amongst the most versatile plants and no garden should be without them. Andrew looks at their history and explores the range available. The talk will begin at 4pm in the Talks Room in the Restaurant, as part of our Garden Centre talks programme, and will last approx 45 minutes with time for questions afterwards. To book a seat call us on 01280 822133. Garden Club Members free, £3 for non-members. SATURDAY 22nd to SUNDAY 23th SEPTEMBER 10am-4pm, both days. Apple Weekend which features the local Honey Show on the Sunday. We will be joined by the Mid Shires Orchard Group who will be providing apple growing advice as well as apple juicing. RHS Fruit Expert Gerry Edwards will be returning to give his apple fruit identification sessions too. We’ll have a Tombola for our charity, BBOWT. WEDNESDAY 10th OCTOBER The Gardening Influences of Beatrix Potter at 4pm. Chris Day delves into the history of Hill Garden and how gardening became as much a part of Miss Potter’s life as being a hugely successful author. Chris asks if this was the original start to how we create our cottage gardens today! WEDNESDAY 14th NOVEMBER at 4pm Designing A Border From Scratch with Lucy Hartley. This talk aims to guide the gardener who is faced with the prospect of turning a bare patch of ground into a new garden border. Lucy looks at the essentials, the pitfalls and the designer tips – old and new. She will start with good ground preparation through to ending up with plants which work well aesthetically for the onlooker and work well together for sustainability.